Simon and Schuster announced the details of the first 2019 Star Trek novels a week or so ago, and have now released updated blurbs for them too. Continue below for new details of these new books. Before that though, there is a new detail on the format too, as listings for these books reveal they are all to be released as trade paperbacks (as well as ebooks) - That's the larger format paperback published by Gallery Books, which previously was used to release additional titles on top the the monthly released smaller mass market paperbacks from Pocket Books (both Pocket and Gallery are imprints of Simon and Schuster). 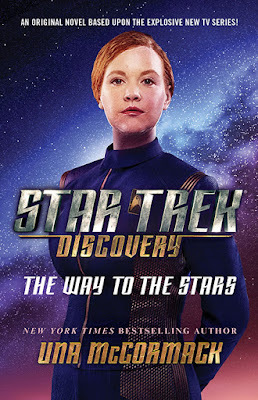 All the previous Discovery novels have been released in this format, but it would appear this will now be the standard across the entire Star Trek novel range. With only three novels so far announced for 2019, it remains unclear if a monthly release cycle will resume or not. Also not yet revealed is whether these books will get audio releases, although in the last couple of years it has become increasingly common for Star Trek novels to get simultaneous audio editions, so I'd be surprised if most if not all did get that treatment. Anyway, the new blurbs! In reverse order, the furthest away, coming in April, is Dayton Ward's TNG book, Available Light, which picks up after his own previous TNG adventure, Headlong Flight, and the fallout of David Mack's Section 31: Control. Pre-order: Amazon, Barnes and Noble, iTunes. Pre-order: Amazon, Barnes and Noble. To keep track of all the latest Star Trek book releases, hit the books or prose buttons on my 2018 and 2019 schedule pages. You can also find series reading lists and author bibliographies on my dedicated Star Trek lists site. I am interested in how the announcement of a new Picard show will affect the TNG novels.